As I mentioned in a previous post I'm currently working on a keepsake box for my nephew and his soon wife to be. They are marrying in June so I've had to work fast on this one. The design of the box is roughly following a recent project in the WoodWhisperer Guild where Marc Spagnoulo showed a humidor box being built. I didn't do a direct copy of this but used some of the techniques like veneering and accent with a different wood. My wife and I also thought it would be good to incorporate some inlaying so we have chosen, with the help of one of Elly's Chinese colleagues, to have some Chinese characters in the design. 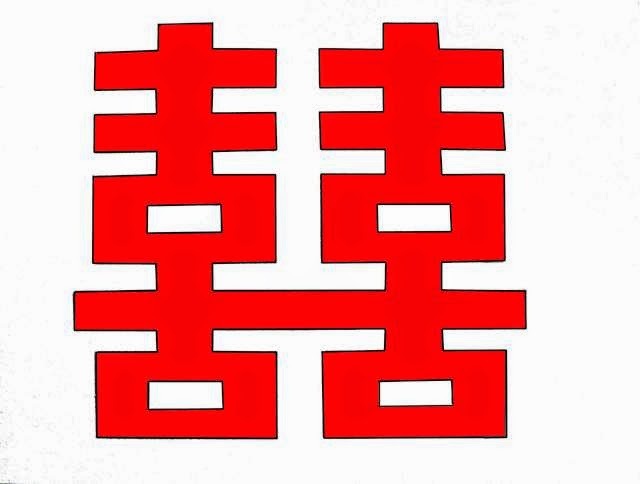 This is essentially the dual happiness character used at many Chinese weddings. My nephew and his fiancée are not Chinese by the way. The intention was to make the character from mother of pearl and then inlay it into some ebony. The ebony was to be cut to a square shape and then inlayed into the box. So here is the finished article in all its glory. inside lined with sapele and felt baize. The entire box is English oak, sapele and mahogany. The veneer on the top is oak burr bookmatched in quarters making up the diamond. This is overlaid over 3/8" mdf that has sapele stabilizing veneer in the inside. The box is finished inside and out first with two coats of shellac. Onto that is pore sealer that was rubbed out to 320 grit. On top are several (12 I think) spray coats of General Finishes Enduro Var satin (semi gloss). This has been rubbed out finishing off with 0000 grade wire wool and has a nice shine that isn't too glossy.